How and Why Did Big Bird Skyline GT-R Get Seized? There is always speculation and "arm chair" quarterbacks in every situation. In this case, the case that has blown up over the last couple days is the Big Bird Skyline GT-R case in Wisconsin. The car is scheduled to be crushed tomorrow 5/30/12. So why was this car seized? Was it a Motorex car? No answer is ever really 100% straight forward. Originally this R33 GT-R was imported by Motorex, before there was even a Motorex, back in 1998. This was prior to VCP-17. This was prior to any Nissan Skylines getting a bond release though the DOT. The car was imported on a TIB (temporary import bond) on the HS-7. Motorex though JK Motors filed their petition that 1990-1999 Nissan Skylines would be able to be brought into compliance with FMVSS(Federal Motor Vehicle Safety Standards). VCP-17 wasn't published into the Federal Register until January 19, 2000. Magazines and by then MotoRex themselves used the car for tests and driving impressions. At one point, prior to the final decision by the NHTSA, the officials there, were asking for a fourth crash test. In this fourth test, they wanted to see an unbelted front impact test. This test could be done non-destructive on a sled, but Big Bird was the car that was going to be up for it. However, the NHTSA decided that the fourth test was a little excessive, and they did not require it. Customer cars were being worked on and brought into compliance, Big Bird was still being used as a demo car. It was used by HKS, it was featured at the SEMA Import Auto Salon. It ran at Pikes Peak in 1999, and set a Showroom Stock record with Rhys Millen at the helm.It ran in the One Lap of America. During the One Lap of America, one of the turbos was hurt, and the car didn't complete the event. The car sat, and more customer Nissan Skyline GT-R's were brought into compliance. MotoRex took the car to the audition for a new movie that was going to be shot, then called "Redline". Craig Lieberman had invited us out, so we put the car on a trailer, and brought it out to show off. 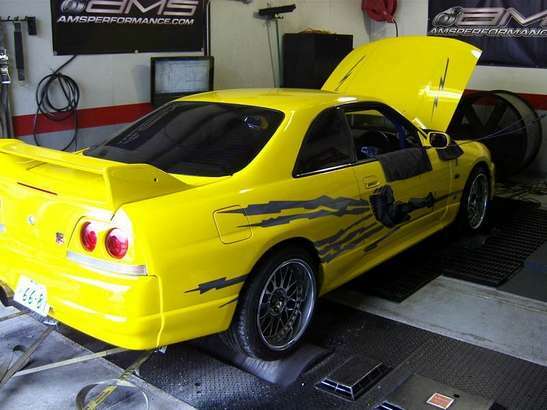 The producers originally wanted the car to have a bigger role, but at that point there were very few R33's in the US, and getting more for them was not realistic in the time frame given. The turbo was repaired, and the car was dropped off to the movie car office. The next time we saw it, it was yellow, and stickered up. Now the question was, what would we do with a repainted yellow R33 with odd stickers on the side? The car was still under a TIB, and bringing it into compliance was not high on the list of things to do. Though SoCal Speed Shop and Holley, we got a direct port nitrous system installed on the car. It looked interesting, but it was only tested on the dyno in this configuration. The car was loaned to a company for the CES show, and when it came back, the engine wasn't running. Supposedly it had bent all the exhaust valves. Never sure what happened, but the car sat again. By now it was 2002, MotoRex had been legalizing cars under VCP-17 for over two years. Put another stock engine in the car, with a set of 2530's, and tried to get it tuned on the nitrous. Best pass was 551 horsepower, but the nitrous was very inconsistent. We later attributed the inconsistency due to unequal lengths of the direct port. The inner two cylinders would hit first, and the car would stumble before going. Broke the front diff(no oil, thanks Tatsu), so the car sat again. On the dyno again, the car did ~650 horsepower to the wheels, with the stock engine, 2530's and nitrous. By then the car had the FNF graphics removed, the wing off it, and some other modifications. First good pass was a 10.8@132 mph. First US 10 second pass. After that the best pass was a 10.7@ 137 mph with the HKS boost gauge pegged. During the 10.7 pass, I killed a turbo, I guess it really didn't like ~34 psi much. We had a set of 2540 turbos, so I gave the 2540's a try. Less area under the curve, about the same amount of power. Still the car hadn't been brought into compliance, and honestly it had mostly been forgotten. Lots of other customer cars coming in, and being brought into compliance. Other than always dealing with Hiro's over promising, and his lack of any real work ethic, MotoRex was going as smooth as 60 grit sandpaper. So one more time, got the car ready, and took it out to Arizona. The car was a bit slower, and the tech inspectors were giving us a bit of a hard time over some of the safety equipment for the speeds we could run. During the weekend, #6 cylinder was hurt, and when the car got back, the engine was pulled again. The transmission was loaned to a customer, and the car sat again. From 2002, until the end of MotoRex's existence, the car sat. Eventually the car traded hands several times, ending up with Justin Beno. Justin purchased a new engine, a new transmission, and got the car back together. It took him several years, but eventually the car was in a driveable condition. Justin put a ton of time and money into the car, restoring it to as it looked during the Fast and Furious. At the end of MotoRex, there were about 30 customer cars, that had been imported, but had not completed the NHTSA compliance process. The NHTSA bond released these cars without the owners having to bring them into compliance with FMVSS. Big Bird was not one of those cars. Rather it just was one of the cars that managed to fall though the cracks. There were times when it would have been possible to bring it into compliance, but it just never happened. So was Big Bird a MotoRex car? Yes it was, but it was never brought up to FMVSS standards. The worst thing that should happen to the car, is that it should be exported. So that's the story. There are things I left out, things that are a little out of order. 0-60 Magazine article on the rise and fall of MotoRex. Whats Going On At MotoRex? Was That Vehicle Imported Legally?